After having attended the conference I can say that participating at Berlin Buzzwords at Kulturbrauerei is a unique experience: I’ve worshipped DJs before in most of the rooms where I now had the chance to listen to a broad series of interesting talks with just the right mixture of tech details and concept overviews! There was a very communicative and open-minded atmosphere among the 600 attendees. The sun in the sky and the beer benches in the yard invited the participants to have professional as well as social discussions. It all started off Sunday afternoon with 150 people attending the Barcamp, participating in 16 different 30-minute talks. Topics reached from visualization art (www.inconvergent.net) over general discussions about probabilistic sublinear data structures to the t-digest algorithm to estimate quantiles (https://github.com/tdunning/t-digest). I was eager to hear Ted Dunning, Chief Application Architect at MapR and thus partner of my company comSysto, talk about how to use neural networks to detect anomalies to catch live problems early and help any CEO sleep better through the night. 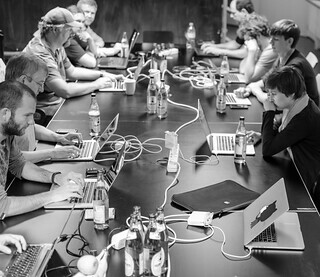 The conference ended for me with a day-long hackathon on Data Stream Mining at Retresco GmbH. We were 20 motivated hackers implementing the heavy hitters and count min sketch algorithm in the programming language of our choice in order to then process and possibly visualize a stream of 8.6 million tweets. The python solution me and my peer (@whitenoise) produced can be found on github (https://github.com/lfoppiano/bbhack-2014). With the focus on getting things done we managed to implement the two algorithms (without much regard for performance) and get a visualization based on matplotlib (even if it isn’t pretty) in six hours. In summary, the Berlin Buzzwords was a valuable experience worth repeating.